Some areas of cloud are either ambiguous or present as an elephant in the room. Certainly a big one is licensing when it comes to Microsoft. The SPLA program is one complicated beast and its new to many people. Turns out Microsoft made a nice tweak to SPLA at their Partner Developer Conference last month (Nov 2010). In summary Microsoft now support you moving your existing virtualised workload into a multi-tennant Cloud which uses SPLA. Of course you still need to PAY for the OS in the SPLA world, well someone does, either the provider covers it or you are on charged. The critical thing is that its now explicitly allowed. There are, I believe, a few restrictions around what the machine image may contain, in that it can't contain something like Exchange. You can leave your old license key in the machine, you don't have go replace it with the providers OS SPLA key. This is a good clarification and continued opening up by Microsoft. Of course the reason for them to do this (just like many of the other changes they have made to use rights over the years), is because they want to do this themselves. With Azure you can move a VHD (virtual hard disk in) that you build yourself on-premise into the Azure Cloud and execute. 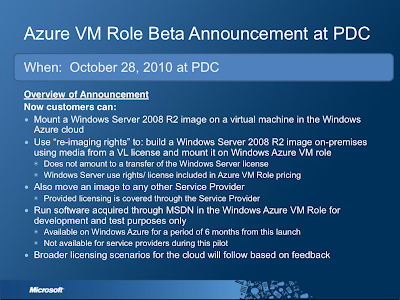 A Virtual Machine (VM) role that runs an image—a virtual hard disk (VHD)—of a Windows Server 2008 R2 virtual machine. 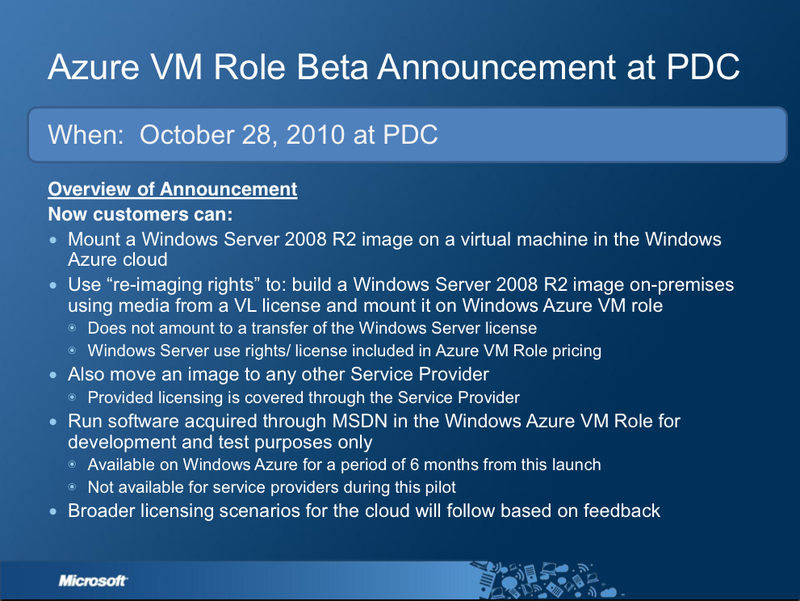 This VHD is created using an on-premises Windows Server machine, then uploaded to Windows Azure. Once it’s stored in the cloud, the VHD can be loaded on demand into a VM role and executed. Customers can configure and maintain the OS and use Windows Services, scheduled tasks etc. in the VM role. As more information comes to hand I will update this post. [Update 23/Dec] Have a reference with some more details. Looks like its called "re-imaging rights". You can use your volume licensing key. It does not amount to a transfer of the license (just the machine image) and the SPLA fee needs to still be paid by someone. You can do this with ANY provider, not just Azure. Also note that this is being trailed with MSDN, hopefully that will be opened up to other providers after the six months.